Love for the tattoos is growing day by day. Art of Tattoo making is going on for many years, and there is no doubt on how much this art is being cherished. The demand for different kinds of tattoo is increasing day by day. Everyone wants their tattoo to be unique and beautiful with a meaning. By keeping all this in mind, we have bought around 25 Geometric Heart Tattoo Designs. All these Geometric Heart Tattoo Designs have a different meaning, and with the various geometrical figures representing the heart, it will invariably look good. From the real heart shape Geometric Tattoo Designs to the abstract geometric heart tattoo designs, we have all in for you. We do have colorful heart tattoos also on our list. These geometric heart tattoo designs which were earlier only limited to females, now even men are trying these tattoos. These tattoos are unique because of their geometric representation of heart in different ways. Also, with this representation, they have meaning to it, either related to compassion, love, character, emotions and many more. So, let’s know about these 25 Geometric Heart Tattoo Designs. The representation of this tattoo is very innovative. It represents the heart in its real as well as in the geometrical figures also. The half portrayal of real heart with details by dot work. And the other half side of the heart by connecting different geometrical figures is catchy. For a female back, this tattoo will surely work, with the Half Geometric Heart Tattoo which is somehow depicting the meaning how a heart is from inside and how it needs to be strong from outside to save it from all the negativities. This geometric heart tattoo design is very colorful and is giving an abstract look with the splashes of colors on and around the heart. Where one side the black outlined geometric shape heart is trying to represent different segments of the heart. On the other hand, the splash of different colors is showing how our heart is filled with mixed emotions both inside and outside. This watercolor splashes our somewhere representing the different emotions like joy, sadness, love, anger, etc. which have surrounded our heart. This Geometric heart tattoo with different ribs in the middle is a perfect style for tattoo art these days. One can get this tattoo at any part of the body with the uniqueness of its design. The heart tattoo is also showing the complexities of the heart in the outer world and the connection between everything that is going inside the heart with the help of ribs. Here, the tattoo is beautifully portrayed on the left part under the left shoulder or side rib. One can get this tattoo done on the chest or even on hands as well. This is a tattoo which is drawn on the left side just above the heart inside. With the dots and the connectivity between the dots, the artist has tried to represent the arteries and the veins. If we look at it from another way around, then it is also looking like a web formed over the heart. The web is formed in such a way that it is making different geometric figures inside the heart. And with a string going out from the heart there is written a quote as well. Overall, what is making this tattoo different is how it is being created just above the heart. A painful but a meaningful tattoo being drawn on the side thighs. It is a complex heart structure which is being stabbed by a sword. The blood droplets above are showing the pain the heart has to go through many times. But still, it survives even after being stabbed brutally. The tattoo is also resembling the sign of bravery. If you want to have a look at the perfect abstract heart tattoo designs, then here it is. It’s being drawn on the forearm and is very stunning design. It is reflecting the bleeding heart which is somewhere showing the pain and the cruelty the heart has to go through. With the white, red, grey and black ink used in the design, the artist has given it a 3D look. A geometric heart tattoo design for men which is being made using the patterns. In this, some parts of the heart are in origami pattern. The other parts are in a different pattern with a Y shape design inside. The shading inside the pattern is done using the dots. And it is carefully taken care of where to use more dots and where less. In real life, we relate these to a lot with love. And getting them inked together on your hands is showing the vivacity of love. The creativeness in drawing the rose, and letting it confined within the boundaries of the heart is very meaningful. The lines coming from the Geometric Heart Tattoo and meeting together at a point is showing a kind of border within which the love is surviving. A heart tattoo being made in the form of a stair on the chest of a man will look stunning. The boldness in the tattoo is reflecting from the dot pattern shading done. You can see the chambers of the heart also being connected to each other using the nerves in this tattoo. Even the valves of the heart are made in stairs form. The quote written next to it is going perfectly with the tattoo design. The little cute anatomical heart-shaped tattoo on the finger is looking very attractive. If you are fond of getting small tattoos on your body parts, then add this in your list. The tiny little divisions inside the heart are defining the areas in the heart. This goes for both the genders and can be inked on any of the fingers. Would you like to get a colorful heart designed on your calf muscles, especially, when the design is full of complexities because of the mix of lines and nerves? The red, yellow, and the black color is used in the form of watercolor spilling inside the heart. It is giving a lively look to the heart. Both men and women will like to get this tattoo on them. Look at this large geometric heart tattoo on the thighs. It has been pained in black and white color. It is being inked using different patterns. There are around 3 types of designs which you will see in this brilliantly made large tattoo. The top has the valves of heart in their real form. Above that, the origami and triangle-shaped patterns are drawn with black color, dots, and lines shading inside it. And above that, a line and a dot pattern are made uniquely. These all three designs are completing the heart shape and are making it look incredible. Tattoos on the knee are not at all a bad idea. You can hide them when you want and can show them up when you like to. This tattoo with the pinch of red color in the heart is making it look lively. However, this tattoo design can be inked anywhere else also. Being made with the help of lines and different geometrical patterns, it is giving a carefree look on the knees. The shading with the lines and the empty voids also resemble different areas of life. Among all the Anatomical Heart Tattoos, this one stands out. The tattoo is beautifully designed on the forearm where the creativity is being added to the geometrical figures. Also, the creativity in making the heart valves is exceptionally vivacious, as it is showing a real heart valve. The black outlining with the dot form of shading is giving this tattoo a perfect look. The small arteries and veins inked inside the valves are defining it more appropriately. When it comes to geometric heart tattoos, the anatomical shape tattoos are trending a lot. Here, is another anatomical heart tattoo which can be inked on the inner forearm. From women to men, both can try this tattoo. The anatomical shape of space in between the heart is giving a hollow look to the heart. It is also providing a meaning that something is hidden safely in between the broad boundaries being made by the geometrical figures. Or if we look at it in another way round, it is depicting the emptiness in life or heart. For a girl or a woman, this is a perfect color, angular heart-shaped tattoo. We are sure most of the women will fall in love with this tattoo because of the colors being used in it. Also, because of the uniqueness of its design. Being made and given a shape of a heart using angular geometric patterns is not that easy. And adding the watercolor splashes of pink, yellow and blue shade is making it more vibrant. The black outlines are also defined very neatly and precisely. Another heart shape tattoo inked on the backside arm. When you look at this black and grey linework tattoo for the first time, you will get a feel for the 3-dimensional figure being carved. The complete tattoo is being made up using the lines. Even if you will notice the outline of the heart, it is also being made up of many lines combining and giving heart shape. Similarly, with the lines, the artists have tried to make different parts of heart dividing them into geometrical blocks using lines. Here is another tattoo which is just made above the heart on the slight left side chest of a man. If you closely look at this Geometric Heart Tattoo, you will notice that it is giving a look of origami in some parts. But in actual it is defining the outlines of the heart and all its essential components. It’s a simple black outlining design but it the geometrical shapes and figures are making it an intricate design. We already mentioned, how much we love this idea of getting heart inked close to the heart. This heart tattoo definitely needs a lot of patience with the variety of color palette being used in its making. It is representing the heart in the cubist form with the vivid bright and dark colors. It is enlightening the different functions that the heart performs. Also, the colorful cubes with the black outline are bringing out every color in a wonderful way. The tattoo is being made on the back side of the arm. 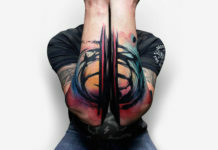 If we look at this tattoo from different angles, it also gives a 3D look. We must say that this is a unique and exquisite design being made by the artist. The heart is made with different cubical shapes origami with the shading done beautifully. The thing which is making this design look fantastic is the flying origamis with the wings. These flying origamis are giving a message of being independent and ecstatic. Along with the design, one can get his or her name or partner’s name or any thought also inked in between the heart and the origami. A small yet powerful anatomical heart is made on the hands of a girl. This functional heart has many structures in it which are well defining the intricate structure of the heart. However, the detailing is not there, but still, the outlines are adding meaning to it. The inside structure comprises of many geometrical figures and that too in different sizes and shapes. It is an excellent idea to get this tattoo inked on hands. Even boys can also try this tattoo on any body part including hands. To make this geometric heart side tattoo look different, many shapes and symbols are being used. In the real heart shape structured tattoo, the Geometrical Designs Mostly the Triangles are Used, leaving some portion of the heart being realistic only. But the heart is completely filled up with different patterns and designs. From the arc pattern to the line pattern and even the dot pattern is being used for shading and filling the geometrical shapes inside the heart tattoo. The dark grey color is used for the filling up, and shading and the black color is used for outlining. We have come up with an idea of Geometric Heart Tattoo for couples also. The tattoo is being made on the arms of both male and female. Both are a replica of each other. If you deeply look at this tattoo, you will notice how every geometrical figure is somewhere connected to the outline of the heart and is confined within it. In the center of the heart, there is a big circle which is connected to the outline of the heart at three points. There are many triangles also forming inside the heart along with other figures. This half geometric heart shape tattoo is a perfect blend of the anatomical heart and the geometrical heart. The black and grey shade of the tattoo is making it more impactful. You can see how purely half of the tattoo is showing the parts of a realistic heart which is confined inside a geometrical triangle with broad black sides. And this triangle is also segregating the two real and geometrical heart from each other. Above you can see different geometric figures trying to give shape to heart with some of the square shape figures falling down. Here in this heart tattoo, the artist has done a great job as he has drawn a real heart art on the left side rib under the shoulder. The heart is being made with the exquisite designs keeping the picture of a real heart in mind. On the top you will see the red arrows going outwards, they can be the symbol of blood flowing out. And the upside-down triangle is definitely a symbolic representation of something which is of great importance related to the heart. The Geometric Heart Tattoo designs are going to be in trend forever. They are unique because of the patterns and shapes used in designing. Also, these tattoos have very hidden meaning to it, and every one of them has its own significance portraying in the form of geometrical heart shape tattoos. You can try these tattoo ideas which we shared above and can let us know which tattoo design you liked the most.